With the print market of book publishing crashing and the digital media part of it successfully taking over, Chuma Spirit Publications is proud to present our new electronic book division entitled Chuma Spirit eBooks, found at www.ChumaSpiritEBooks.com. To kick off this groundbreaking introduction, I am excited to bring to you my third book, My Ancestors Traveled Them Home. As a sufferer and survivor of death and bereavement, I used memoirs and poems to speak about the demise cancer imposed on my mother and my favorite aunt, and the anguish I suffered when AIDS took the life of one of my closest friends. Despite enduring melancholy, loss, and hopelessness, with the help of the ancestors and my imperiled loved ones, I realized that death is merely an entryway to everlasting existence in a different form. I hope you will consider reading my book, which at times can be heartbreaking and painful, and at other times triumphant as I discovered a celebration of the afterlife through the power of love. 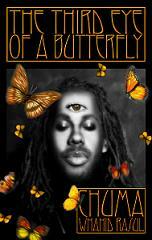 Also, (with the exception of The Third Eye of a Butterfly) every book from Chuma Spirit Books that was previously published in paperback is now available in ebook format, as well. All you have to do is go to Chuma Spirit eBooks to download free sample versions and preview our ebooks for consideration of purchase. As a free gift to you, whenever you buy an ebook, you will receive a complimentary paperback copy of my very first book of poetry, The Third Eye of a Butterfly. Just follow the instructions on the website to redeem your gift. Also, coming this year, Chuma Spirit Books will be releasing other books of poetry, short stories, novels, erotica, self help, creative thesis, and memoirs from me and other amazingly talented authors. Go to Chuma Spirit Publications for more details about these announcements. For a detailed catalog of our books, please go to www.ChumaSpiritEBooks.com or review the company's myspace page. If you have any questions, I can be reached at 888-88-CHUMA. Thanking you in advance for your interest in our literature and please take a moment to read The 24 Reasons Why You Should Read eBooks. From this information, you will appreciate an ebook's benefit.